Springtime in Oregon is hard to beat when it comes to weather. 72 degrees and sunshine? Yeah, that works. Being a motorcyclist, you’ve got three guesses how I’ve handled it, and the first two guesses don’t count. 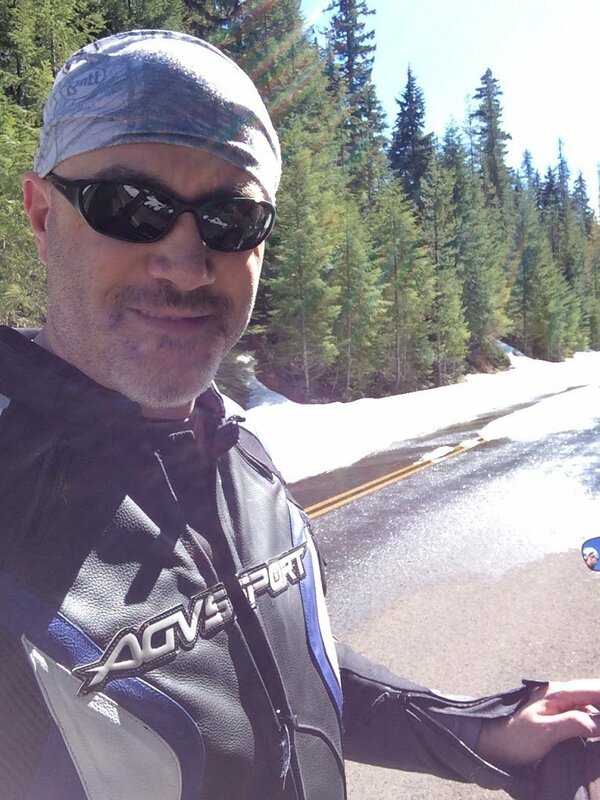 Two days in a row, I rode my 2012 Suzuki GSX-R750 “Shoot to Thrill” past Estacada, up highway 224 to Ripplebrook ranger station, and then south on NF46 toward Detroit. Both times I was turned back by snow, as I expected. What was surprising was how far I got before the road was covered enough to make me turn around. 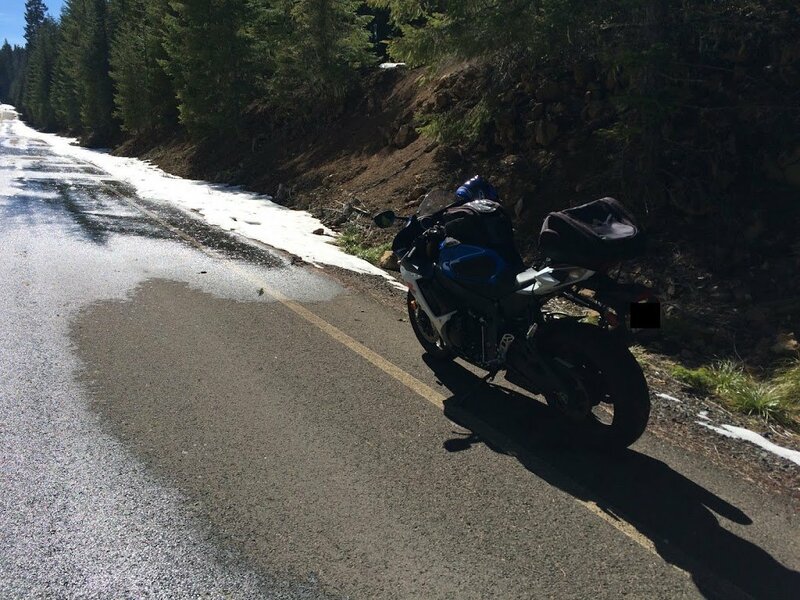 Although I didn’t have a GPS on my bike, I would estimate the snow is at 3,300 feet elevation, and was within a few miles of the summit at the power lines. If you can get that far, the rest of the route should be open. They are doing repair work at mileposts 31-37, and delays during the week are common. This is to repair damage to the cliff face after the big fire that occurred about a year-and-a-half ago. Highway 224 is in reasonably good shape, otherwise. NF46 has some issues, however. There are a few more potholes, some of which would give a sport bike rider a hard time if they were hit at speed. There are also some trees down, blocking portions of the roadway or hanging low over one lane. It’s best to take it relatively easy on the sighting lap before giving it the beans on the return leg. When I rode up the first day, I met two guys on sport bikes stopped in the road. They told me the road was covered a mile ahead, and although a pickup truck had driven up through the snow and parked at the top of the hill, it would be impassible to all but a dirt bike with knobby tires. One the second day, I rode to that point myself and stopped at the snow to take a break before turning around. On the way back, I came up behind a guy on a sport bike west of Ripplebrook. We zipped along until we came to the construction delay, and chatted briefly before continuing on to Estacada where we exchanged contact information. His name was Wayne and he was riding a 2013 Kawasaki ZX-10R. We agreed to talk more about future day rides on our sport bikes. This past weekend I went for an overnight trip to visit family at their home in rural south-central Washington state. I rode my 2012 Suzuki GSX-R750, nicknamed “Shoot to Thrill.” The weather was perfect, the road conditions were great, the bike ran wonderfully. I left Gresham Saturday morning and got on I-84 westbound. At I-205 I crossed the Columbia River and got on SR14 eastbound. Between Washougal and North Bonneville I got stuck behind some slow cars that for whatever reason were all Oregon drivers. To this day I don’t know why people think driving 10 mph below the speed limit is a good idea. Here is the Google Maps route I took. I stopped at the rest area on the north end of the Hood River bridge for a bio break. The sun was bright, air temperature was about 60 degrees, and the wind was calm. The river was nearly mirror perfect. Continuing east I had more of the road to myself without the hassle of slow cagers. At Lyle, I headed northeast on highway 142. This road follows the Klickitat River and has many fast sweepers and a few tight turns. The road was in great condition and didn’t appear to suffer any damage during the winter. In Goldendale, I rode south a few miles on highway 97 to the Chevron where I filled up my fuel tank. I rode 133 miles on 2.3 gallons of gas. What a machine! After a quick snack, I continued east on the Bickleton Highway, then to my sister’s house. The last two miles were on gravel road, and although that’s never any fun on a sport bike, I kept it upright and stable. The ride home the next day was even better. Rather than backtracking the whole way, I continued east to the tiny community of Bickleton before heading south to Roosevelt. This stretch of road is simple at first glance, but has some interesting characteristics. It has numerous straight stretches a few tenths of a mile long, followed by a 90 degree turn posted at 30-45 mph. Each turn is banked, and the pavement is in perfect shape. There is some gravel on many of the curves, however, so picking a good line and maintaining control is critical. The other interesting aspect of the route is the rows and rows of wind turbines. Here is the Google Maps route I took home. The road descents about 2,000 feet to the road-side community of Roosevelt along the Columbia River. It comes to a T-intersection with SR14. I turned right and headed west toward home. From this point forward, SR14 can be extremely windy. Today, however, it was calm and I had the road practically to myself. I stopped in The Dalles for gas and food before continuing west. Traffic increased, and there were lots of motorcyclists about. Several sport bike riders gave me the signal for law enforcement ahead (by patting the top of their helmet). I saw one unmarked Washington LEO with his lights flashing, having pulled over a guy in a blacked-out Honda accord. I got two more warnings for cops but never saw where they were hiding. I crossed back to the Oregon side via the Bridge of the Gods to Cascade Locks. I pulled up behind a buddy in his car just as we were getting onto the freeway. Small world! By the time I got back home it was in the upper 60’s.